LAGUNA BEACH, CA — The Laguna Riviera Hotel, formally incorporated in 1948, is a warm, family owned and operated beach front resort located in the world famous artist community of Laguna Beach, California. Just a quick stroll to the best restaurants, art galleries, boutiques, summer festivals, museum and nightclubs in Laguna. The property offers a mix of 41 unique rooms and family suites, set amidst an oasis of tropical gardens terraced to the oceans edge. 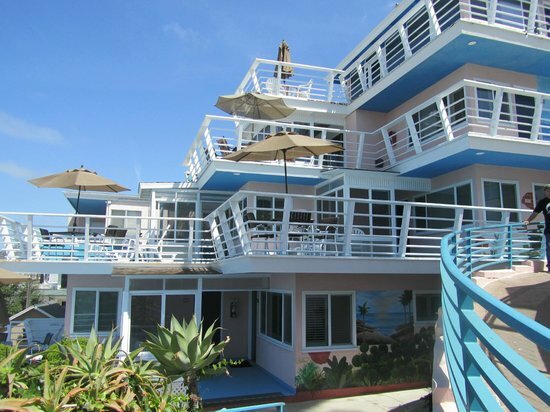 The Laguna Riviera stands out among Laguna Beach Hotels because it is a true original never changing hands, and staying true to the spirit of the Laguna Beach and its’ artist community. The property has plenty of comforts and thoughtful amenities like high-speed Internet access, fire places, private decks, private beach access, complementary continental breakfast and beach front rooms with spectacular ocean views and dazzling Catalina Island sunsets. The Laguna Riviera has accommodations for all, from comfortable studio kitchenettes, affordable hotel rooms for those on the go, up to beautifully appointed suites with full kitchens and private decks designed especially for the vacationing family.